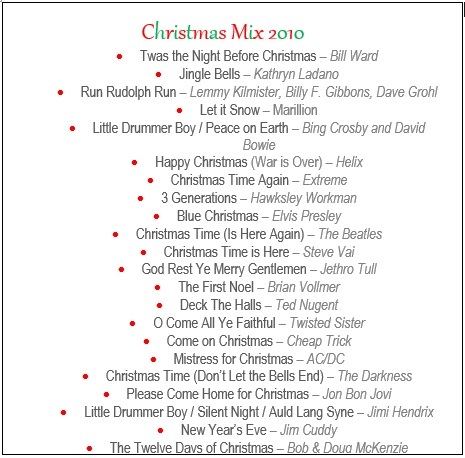 Did Slade’s “Merry christmas Everybody” ever make it onto a Christmas Mix? No I have actually not heard a lot of Slade. Their stuff is very hard to come by here. HMO will back me up here, if you see the Alive! anthology, you should get it. It’s definitely a cool album for Christmas, lots of great songs. Have you every used anything from Bob Rivers and Twisted Radio on any of your Christmas compilations? It is! You might also like Jingle Hell’s Bells. That ACDC tune is a friggin classic..so hokey/cheesy and Johnson sounding totally in Creepier mode! I think I’d enjoy it. There’s a lot I’ve never heard before. I’ll have to do some searching on Spotify. Not too shabby and your defense of the Jon Bon Jovi songs is fantastic! Thanks man. I will defend Bon Jovi circa 1988-1995 vehemently! I like this mix. Especially The Darkness, with the one Christmas song I actually listen to on regular days! Yeah me too! The fact that they put it on their live album (meant to be played year round) tells you something. Oh man, every year instead of flipping over White Christmas to side two I would quickly switch over to the CD player and play Mistress for Christmas. My Mom hated it and would complain all the way through. Good times! Also, forgot about that Lemmy, Gibbons colab! Need to find that. It is on the CD We Wish You a Metal Xmas. Sweet! They have it on Spotify. Just like my mom complained when I played Big Balls at the dinner table. Geez Mom, they’re only singing about fancy parties! Get your mind out of the gutter. Bing & Bowie, the Darkness – I’m in!